PolyCool is a Composite board of a white Vinyl foil laminated to one side of Expanded Polystyrene sheets. 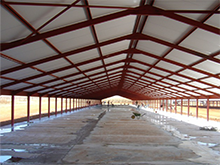 It offers a durable, washable and aesthetically pleasing insulated ceiling solution. Ceiling boards are available in widths of 600 and 1200mm and any length up to 7500mm. Cost effective, durable and easy to install.